Ancient dogs all over the world were routinely buried in ritual fashion, on their own or with people, for at least 14,000 years, making the practice of burying dogs as old as dogs themselves. Dog burials and human/dog interments reveal a great deal about the complex relationship that ancient people had with their dogs but require that they be recognized in the field, carefully exposed, photographed and excavated. 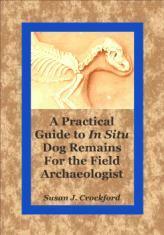 This manual is meant to aid field archaeologists and physical anthropologists everywhere in the identification and excavation of in situ dog remains (complete and partial dog burials, including inclusions in human interments). 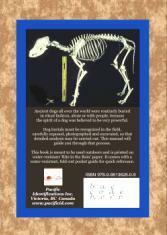 It consists primarily of labeled photographs of modern and ancient dog skeletal elements, both adult and juvenile. Recommended procedures for excavating dog burials and mixed dog/human interments are provided, while some background on the evolution and history of dogs puts the practice of deliberate dog interments into cultural context. While this field guide is not intended as a reference for laboratory analysis, it would be useful for preliminary work. The book is spiral-bound and printed on water-resistant ‘Rite in the Rain’ paper with a waterproof cover. A quick reference Pocket Guide insert, printed on water-resistant heavy tag stock, is provided with the book (additional copies of the pocket guide can be purchased at point of sale or with proof of purchase afterward but are not sold separately). See below, outside and inside views.